Hollywood's greatest actors and best directors. Star level writing and production values. A world renowned Hollywood legend as the host. And a full hour weekly to showcase it all to the listening public. Sound like the perfect formula for a drama program from the Golden Age of Radio? Ask any Old-time radio enthusiast and they'll likely agree that it is indeed that and that one program captured the magic of that formula better than any other "The Lux Radio Theatre" (1934-55). The Lux Radio Theatre, based in New York, premiered on the Blue Network October 14, 1934. The name derived from the show's sponsor, Lux Soap from Lever Brothers. Although Lux in the beginning was primarily an anthology based on Broadway shows of the period, it recognized the value of Hollywood star power from the start. But when a Hollywood actor traveled east, competition between the New York shows for their time was heated. Stories abound of the various imaginative and cunning ways that scouts for Lux snagged top talent, including one man snatching up Leslie Howard's suitcases and leading the star to a waiting cab. Only after they were in the car and Howard asked who the man was did his new acquaintance inform him that he worked for Lux and Howard was going to be on the show the next night. And he was. Even with this creative recruitment technique, The Lux Radio Theatre teetered on cancellation within a year of its debut, due largely to lack of available talent in New York. Even a move to CBS on July 29, 1935 didn't change the downward spiral. Ratings dropped and many involved with the show scrambled to save it, Danny Denker, an executive with the ad agency handling the Lever Brothers account, was given the job of saving the program and came up with the idea that did just that, if a show needs stars, then go where the stars are. 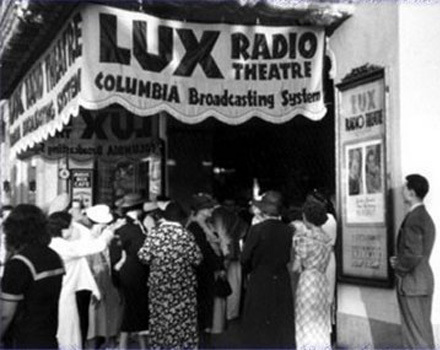 Denker advised that production values of The Lux Radio Theatre had to be opulent and top notch and that films, not Broadway shows, should be the focus, and most of all, the program had to come out of Hollywood, not New York. Denker's suggestions became fact on June 1, 1936 with the first Lux Radio Theatre program from Hollywood. And from the beginning, opulent and top notch was the new standard for the program. The inaugural Hollywood broadcast set the bar for future Lux Radio Theatre shows: budgeted at $17,000.00, more than half of that going to pay Marlene Dietrich and Clark Gable, the show's leads, and acclaimed director Cecil B. Demille as host. As the six programs in this third volume of Lux Radio Theatre clearly show, there were many reasons that this hour long program was a top-ten network show for much of its nearly twenty year run after moving to Hollywood and remains one of the most beloved shows by OTR collectors today. Each broadcast required at least 50 people, including 25 musicians in Louis Silver's orchestra, usually 20 or more actors, and all the accompanying technicians. Each play took five days to complete on a harrowing Thursday through Monday schedule, the last rehearsal being at 7:30 PM Monday night before the show went live at 9:00 PM. The six programs spotlighted in this volume are from early 1939 and are headlined by some of the seminal Hollywood talent of the era, including James Cagney, Ralph Bellamy, Lionel Barrymore, and Maureen O'Sullivan. That combined with the classic films covered (such as Stage Door and Count of Monte Cristo) and the sparkling audio quality of this newly restored and remastered set makes Radio Archive's third volume of The Lux Radio Theatre an absolute must-have for OTR fans. !939 was considered the greatest year in the History of Hollywood. From "Gone With the Wind", "Wuthering Heights", "Ninotchka", "Goodbye, Mr. Chips","Stagecoach" and many other great films were produced by the Hollywood Studios in 1939. Each of these selections is hosted by Cecil B. DeMille. Many of these radio adaptations can be heard in this series, with some of the best known Movie Stars in Hollywood from Lionel Barrymore and Ginger Rogers to many of the luminaries of the period. The Radio Archives Staff have restored these radio adaptions from the LUX Radio Theater original transcription discs to their original sound and tonal clarity as would have been heard in 1939. Each Volume is made of heavy duty plastic and including individual plastic sleeves for the added protection of each CD. The artwork on the cover is either painted by a well known artist or photographs from the shows are used as is the case on this Volume III from the LUX Radio Theater.